MVAgusta.net > Marketplace > Evolutionbike.it > New products!!! Compatible with: Turismo Veloce Euro 4. 3 ways Mv Agusta exhaust. Stainless steel with carbon silencers. Metallic pin MV Agusta logo. Stainless steel with ceramic total black treatment. 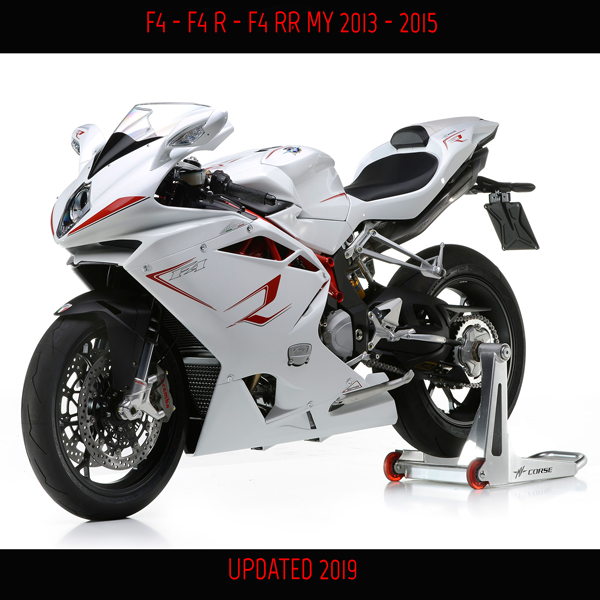 MV Agusta F4 - F4 R - F4 RR MY 2013-2015 Updated Genuine Parts 2019! Compatible with: Brutale 4 cylinders, B3 Euro 3, B3 Euro 4, Dragster Euro 3, Dragster Euro 4. This new mirror was developed with a new fixing system next to the grip instead of the handlebar end. Fixing arm and mirror body are entirely made of aluminum CNC machined. The mirror glass has the correct dimensions and is convex as requested by homologation. The mirror can be fixed either on the left or on the right side of the handlebar. Compatible with: F3, B3 Y12-->Y19, Dragster Y14-->Y19, Rivale. Left side and right side switch features in one switch. The switch body is machined from full 7075 aluminium (Ergal) bars and has then undergone a hard black anodizing process that enhances processing with CNC machinery. All the buttons compliant with the IP67 military standard that certifies the switch itself is water resistant. The operation of all buttons is guaranteed by over 700,000 cycles. Assembly is very easy and plug&amp;play: just dismantle the original switch with the tools recommended by the Manufacturer and the master cylinder clamp; then fit the CNC Racing switch connecting the plug to the bike original cable. Nothing else is required and you can always go back to the original configuration without any modification. MV Agusta Reparto Corse logo engraved with laser. All the buttons compliant with the IP67 military standard that certifies the switch itself is water resistant. The operation of all buttons is guaranteed by over 700,000 cycles. Assembly is very easy and plug&amp;play: just dismantle the original switch with the tools recommended by the Manufacturer and the master cylinder clamp; then fit the CNC Racing switch connecting the plug to the bike original cable. Nothing else is required and you can always go back to the original configuration without any modification. Right handlebar switch Pramac Racing Lim. Ed for OEM and RCS Brembo brake master cylinder. Compatible with: all MV Agusta models. Rear brake oil tank 20 ml with level porthole machined from solid by CNC machines with subsequent red surface anodization which ensures quality and durability. MV Agusta logo engraved with laser. The cap is not included.